This one has been bouncing around for a while now, but T-Mobile has finally made it official. The Samsung Galaxy S 4G will be landing on February 23rd with the power and speed of T-Mobiles 21 Mbps HSPA+ network. It’s everything that was good about the original vibrant, sans Avatar, but with faster network speeds, a front facing camera and Inception. Looks like it will be retailing for $149.99 (just like The Shack) with qualifying plans. Don’t let us down with this one Samsung. ← LG Optimus Pad (T-Mobile G-Slate) Previewed At Mobile World Congress, Lots Of Video! I’m a part time TMO employee. Currently have a BB9700 (os6) as my daily user. At home I have an old G1, Moto Cliq. Son has a G2 and wife Cliq 2. I really liked the Vibrant but felt that I didnt want to use my discount on that phone. Personally its still one of my favorites. Now with the addition of FFC and 4G, I’m all over this. My parents live in Florida and Ive got family in AZ, NY, PR, so this video chat will come in handy. Sounds like a good choice and you MADE a good choice by waiting. I dove head first into a Vibrant on day one but no regrets. Been holding out for the MT4G but I may actually go for this one. Just hope the updates aren’t as scarce as the Vibrant. U want updates on this? EDIT: should I say you EXPECT updates on this? It’s more than likely IMO especially since it has HSPA+ but it probly won’t come to TMO for another 6 months since they are just about to drop the Galaxy S 4G. I like the Galaxy S 4G, but I fear Samsung’s lousy track record on Android updates. Even though my Motorola Cliq spontaneously reboots a few times a day, I’ll just wait for the HTC Pyramid. Samsung keeps failing with updates, and awful UI, yet why does everyone keep coming back for more? If you’re getting a samsung product .. get ready to rely on open source community for your updates. So no $10 data for this phone? Only the unlimited web plan? Yes Unlimited only if you buy it on contract. No there will be the $10 data you just won’t get the mail in rebate since you need to have unlimited to get the rebate. great, 4G when there’s barely 3G coverage from TMO in most places… and who’s going to update the phone? XDA? hahha… and right when the dual cores about to hit… what’s the point of buying this phone again? With the Galaxy S2 dropping, I couldn’t imagine who would want to buy this phone? Tiny hand people? LOL like on that old Burger King commercial. I would rather carry a normal sized screen phone then one that’s as big as a a brick! I sold my Vibrant in anticipation of getting the S2. It’s an amazing device and I assume Samsung will be giving it to all the carriers like it did the Samsung Galaxy S. Who would not want it? Well, people who don’t want to pay what this is going to cost, for one. Assuming a subsidized $200 price tag, carriers will lower the price of the Samsung Galaxy S from free to $100. The majority of customers pinch pennies, so saving $100 to $200 will be significant to them. 1650 mAh battery (supposedly 20% decrease in power use). I really wanna get the Galaxy S2 but I fear that I’ll be missing out on the phone Honeycomb or whatever comes after Gingerbread. Hopefully by June when I’m eligible, the next OS will be announced and put all these FroYo’s and Gingerbreads to rest. Everybody is always crying about updates and how fast they do or do not come out. Who Cares!!!! If you are not happy with the phone software then why did you buy it? 2.1 is a good software and 2.2 changed a few minor things on the vibrant but no big overhaul. If you are going to buy a phone, buy a phone for what it has not what its going to get. that would leave more room in the comment section for people who really have something educated to say. Well I cant comment on the Vibrant 2.2 update as I took the crappy phone back after 2 days and went back to my Nexus 1. But i can say there is HUGE difference between 2.1 and 2.2 under the hood. It was a major update that added/made some things more proficient. The reason people complain is when you buy a product that is suppose to be the makers FLAGSHIP device then then maker gives you a big F U to updates and support(Update 8 months after a buggy product launch is not proper support compared to the support they gave the UK version, its not a ver trusting thing to do. Should of got a G2. Best phone their is..hands down. no its not. I sell cell phones and the mt4g is the thing we see the most people bring back cause its not working/crashing etc even right out of the box. Except it was designed with a massive flaw. The processer run at 500mhz which when you are running 1.6/2.1 it can barely handle it took mine 10 minutes to send one text message the other day paperweight in an understatement. well galaxy s2 is not coming to tmobile! thanks for the link. Yeah that definitely does NOT mean that TMO won’t get the phone. They would be real F! @#$n stupid not to get it though considering it’s popularity and the lack of phones that size in their line up. the galaxy s2 is no where close to coming to the US yet so don’t be so quick to jump the gun. More than likely Samsung’s going to do what they did with the original galaxy s phones and release it for all carriers. Just an educated guess. I just want to watch Inception…lmao. Good addition to the device family though I wont be buying it. The Vibrant 3G is good enough…for now until t-mobile’s next big thing…maybe. But once we got it in our hands (using mine now, since I sold the Vibrant) we discovered it’s not really that big of a phone. It can easily fit into a shirt pocket. Comparing my Vibrant’s 4″ display with the HD2’s 4.3″ screen, I think the better size is to keep it at 4″. That’s a good compromise between a too-small 3.7″ screen and too-large 4.3″ display. Sidenote: Where Samsung makes up for the large display is the weight. My HD2 weighs in a 5.5 ounces. The S2 is reported to weigh 4 ounces. All said and done, this is really a matter of preference. For some, a 4.3″ phone is simply too large for his tastes, no matter the weight. For others, a 4.3″ display is an essential feature. This is the first generation Galaxy S with HSPA+ and a second camera added. It’s NOT the just officially announced Galaxy S II, with a 4.3″ screen, dual core processor, etc. Bummer, as it makes it less likely that T-Mobile USA will offer the new version any time soon. Again with the update talk. Anyway, as I also said before, pay close attention to MWC, advertisements, enclosures in the box, and online terms of service. I would lay odds that you are not going to see any manufacturer or carrier ever again imply or mention the word “update,” lest some on the Internet fabricate the expectation or right to OS upgrades and updates. Besides, this is all Google’s fault not the manufacturers. Google is the one who keeps coming out with new OS versions or incremental updates every few months and also announces new versions on the horizon. And because Android is open source, app developers write programs that work on an existing version of Android only. End result, users download apps off Market and find out the app won’t work on their versions of Android (complicated by the fact that app developers can’t spend the time and resources for apps to work on every iteration of Android). The same goes for manufacturers. Many people erroneously think that their phones should be able to run any version of Android. After all, they think, the OS is named “Android” and the version number is so close to the OS on his phone. So why shouldn’t it work. All this does not matter though. Fact is, 99% of the 2 billion cell phone users in the world don’t know about nor care about updates or upgrades. For Android updates there should be some reasonable expectation that their phone will not be a paperweight for the next 12 months. If people buy a phone when it first comes out and is tied to a contract the customer should have some utility with their phone making sure they have a decent amount of software to use with their phone. There should be an end of life schedule with Android operating systems kind of like how microsoft phases out their operating systems and office suites and this would solve of many of the problems. I don’t think it’s unreasonable to expect updates when bugs exist, or a new OS is released. That was the precedent set by TMobile and Google at the beginning. It was one of the draws to Android for many people, including myself. When companies want to distinguish themselves (kid themselves) by skinning over Android, it complicates things. I agree that some are unreasonable in that they whine for a new OS as soon as it’s rumored to be in development. I understand the difference between childish diatribes and reasonable contribution to any thread. I simply ignore the former in favor of the latter. As a Nexus One owner, I am looking for an upgrade device, but nothing fits the bill, partly because of OS skins, and the fact TMO insists on mediocrity when it comes to smartphones. It’s getting to the point that if Apple releases an iPhone 5 with a 4″ screen, I’ll take it. I’m curious if this phone is still using that crappy rfs file system…. Anyone here have any knowledge about how difficult it would be for Galaxy S2 (SII) to go 4g? I mean, the galaxy s2 looks amazing.. except for the fact that 4G is out now.. and is probably going to be the new standard in a year or so (maybe not if plan prices are ridic…)… Whats the likelihood of Galaxy S2 going 4G for its US debut? The reason people complain is when you buy a product that is suppose to be the makers FLAGSHIP device then then maker gives you a big F U to updates and support(Update 8 months after a buggy product launch is not proper support compared to the support they gave the UK version, its not a ver trusting thing to do. LOL… can you whiners quit with the update complaints. No one cares, really. You must not be aware that AT&T Samsung Galaxy S owners are complaining about not getting updated to 2.2. And they all point to T-Mobile Vibrant owners having the update, so why can’t they. LOL. Check out this Feb. 3 post on an AT&T forum. You think other carriers are better with updates? Remember HTC halting the Evo update because it was bricking phones? If you would like I can post complaints that people have had about the lack of updates by RIM, Motorola and even the iPhone. is the gps even gonna work on this phone???? So we got this phone in our store, Walmart, last night and we are able to sell it….So check your Walmarts….I played with it. Compared it to my 3G Vibrant and honestly…I’m not impressed. Its a bit lighter than the Vibrant(even with the gel cover), the back is grey as we’ve all seen, it has the front camera, but powered on…its the same phone. 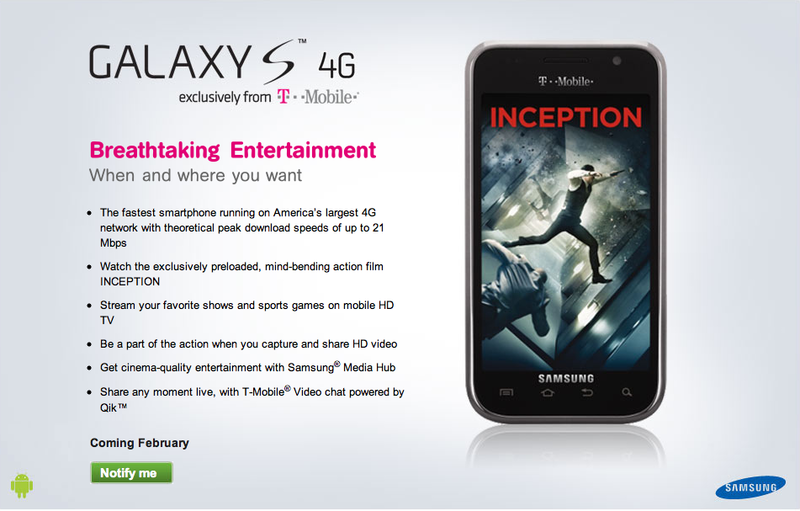 Inception can only be seen if you’re able to pull data because it uses Samsung’s Media Hub to access it. It’s not like Avatar when they gave it to you on the chip. Overall, T-mobile should’ve put this phone out in the first place and skipped the 3G version. I didnt try the GPS because I didnt want to put my sim in it to set it up and then erase it. Overall, if you have the Vibrant already, keep it. I see no reason to upgrade to this phone. Its a waste of an upgrade and as much as I love T-Mobile, I wouldn’t give them another 2 years of dedication for it. T-Mobile is not selling this phone as an upgrade to the Vibrant. It’s simply an “interim device” to get as many 4G phones on to the market, in line with T-Mobile’s current 4G ads and video calling. In fact, I can’t recall reading anywhere that Vibrant owners have even considered buying this phone. If anyone is a Vibrant fan, I am, they are waiting for the S2 (that will be the hottest handset on the planet, IMHO).